Bandsaw blades come in a wide variety of lengths, widths, thicknesses, and tooth configurations. In order to determine bandsaw blade length for your saw, please reference our Bandsaw Blade Lengths & Manufacturers page for a list of common saws and sizes. If you cannot find your saw model or are unable to locate a manual, Detroit Band Saw can teach you how to determine bandsaw blade length. You will need a tape measure, pencil/pen, and a clear path or floor space. Just follow these 5 steps. Make a mark on the blade. Place a piece of tape on the floor and make a mark to determine your starting point. Roll the blade in a straight line until the mark you previously made comes back and hits the floor. Make a second mark on a piece of tape. Measure the distance between your two marks on the floor. You now know the length of your bandsaw blade! 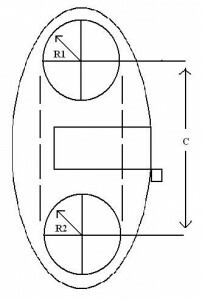 If you do not have an existing blade, there is a mathematical equation to help determine saw blade length in inches.